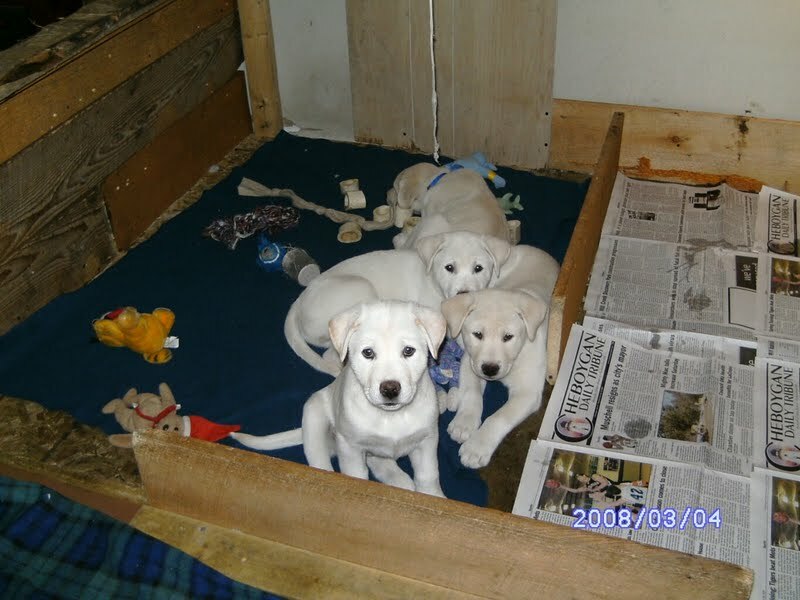 We constructed the whelping box in our bedroom and even though it was the coolest room in the house, it was the safest and the quietest. It started out being about 4 feet by 4 1/2 feet and would undergo several additions as the puppies grew to accommodate their needs. We built a raised floor that was insulated underneath. We constructed it in the corner and added another wall to make it three sided in order to block off the draft from the hallway. We had a roof to contain heat and could also hang a heat lamp for added warmth. The open front was blocked off by a board, so that Mommy Dog Silver could get in and out, but would keep the puppies safe. As the puppies grew so would this wall, board by board to keep them in. 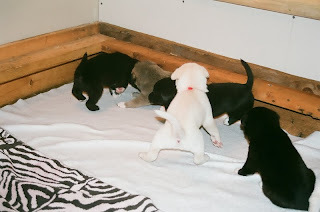 There were also bumper rails all around the inside walls of the whelping bed that stopped Silver from laying on any of her puppies that may be up against the wall. First addition where zebra towel is. 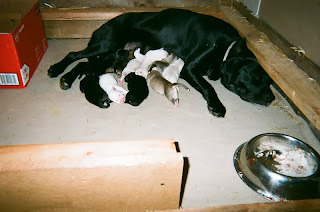 By the time the puppies were two weeks old, Silver needed to stretch out more to nurse as the puppies were getting bigger. So we added another foot to the front of the whelping bed giving Silver more room to expand. Zappa leading the way to the new potty room! At three weeks old I learned you could build a potty room and that the puppies would learn to use. So we added another foot and half on to the front of the whelping box and lined it with newspapers for the beginning stages of potty training. The four white dogs showing off in the play/sleep area with the potty room now in back and the new dining room addition in front of them. 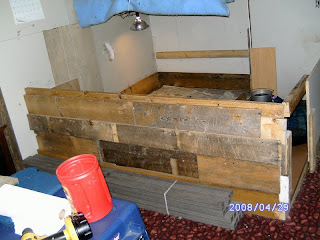 By the time they were four weeks old, we were able to take down the extra third wall and add another area on the side for feeding, playing and sleeping. 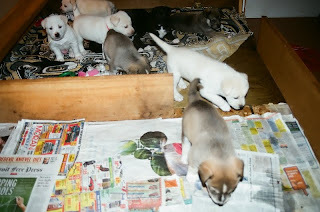 They were beginning to have more play time outside of the whelping box now, so with the new addition of the "dining area," they had plenty of room. Shortly after that we switched the potty room and the sleeping/play area around for two reasons. One, we needed a bigger potty area and two, when they would run to greet us they were running through the potty room. Transition took a little while, but they soon caught on. After all the puppies had found new homes, it took us a couple of weeks before we finally had the heart to tear down the whelping bed. It was a sad time, but one of a new beginning. Daddy built two crates for Zappa and Fiona where the whelping box was. It was only right that they should have their own special beds in the spot where we hold so many beautiful and fun memories of our litter of puppies, helping to keep those memories alive. You all did a great job preparing for the arrival of your pups. Just one more example of the love you have for your pets. How sweet! I've never raised puppies, so this was very informative. I never thought about all the things that come into play. Wow, that was an amazing story. That whelping box w/ the diff rooms is awesome. Y'all did an incredible job. I got all my huskies at 3 months or older from the shelter so I've never seen all the steps that need to get done for care of a litter. Thanks for sharing it with us, mommy learned something about raising pups today! What love went into the preparation and the expansion of the whelping box! Thanks for sharing these tender memories. This post brought back a lot of memories for me. My mother use to breed Spring Spaniels and we had the whelping boxes going. I remember those sides...weird memory that I have. LOL The puppies are so cute.